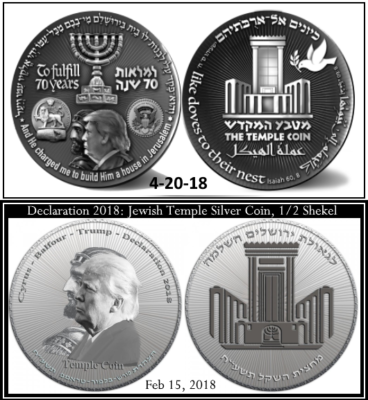 American President Donald Trump has been placed on an Israeli coin, a half shekel (shakel), he is portrayed as today’s version of the Babylonian King Cyrus, the king that ordered the building of the second temple which as a fraud, was demolished by Rome and derided by Jesus. Before we enter that study we need to fully understand how Freemasonry plays into the deception, this shows itself at the level of the Royal Arch Masonry of the York Rite, 7th degree, at which the adepts take the oath to Israel and not the Church of England. Royal Arch Degree of Freemasonry” — quoted from Craig Heimbichner’s book Blood on the Altar, page 83. Also pictured on the page is the Masonic Jewel, Royal Arch, 7th Degree rite in which York Rite Freemasons pledge allegiance to the Jewish nation. The Masonic jewell of this rite is Solomon’s Seal with a sun blazing inside a triangle in the centre. In the paper NBC poses a number of questions relating to why in the very early part of his reign did King Cyrus let the Jewish people leave Babylon and return to Judah. He first of all sets out the background as to why they were in Babylon in the first place and how King Cyrus came to be the ruler of a vast area comparable with the territories conquered and held by Alexander the Great in later times. King Cyrus had a strategy for governing which involved the release of a number of enslaved races of whom the Jewish people were but one. The paper provides an interesting insight to the historical and strategic background to the ceremony of exaltation. Taken from the website of : The Holy Royal Arch of East Lancashire. Source. For a secret society that once upheld the Church of England, to be overly concerned with the Jews and the building of a third temple, is a telling revelation indeed. More than that, with the minting of the Trump/Cyrus Israeli half shekel, and, Trump expanding war and the forced movement of peoples across the globe, opening the door for Putin and his Chechen forces to cause enough havoc in Syria leading to a situation whereby Russian forces can encircle the Islamic nations that surround Israel to keep them contained as the fake prophecy of a third temple moves forward, it is fair to suggest that we need a deeper insight as to what this actually means in real terms as it relates to the politics playing out today from a secret society that feigns to be Christian inside a Christian nation, and yet from its own scribbles and drivel, clearly shows in its actions that it serves a nation that stands tall above all others as the most racist and apartheid formed constitution we have seen in modern day politics. Cyrus knew that dispersal of his newly acquired ‘slaves’ would work but only if it was directed and authorized. He is not simply saying, as we believe that the Pharaoh in Egypt once said of the Hebrews, “GO”. What Cyrus is saying is, “I can see that if these dispossessed peoples are given a task to fulfil, a work of restoration and recovery of the land to achieve, then they will be more content and I will have a much more productive empire. That is why he gave them documents to describe their purpose in returning and the right to do it in his name. So, there we have it, Cyrus dispersed his indentured servants into the lands of others with a written mandate from Cyrus as to what his slaves were commanded to carry out in the lands of another, for the benefit of Cyrus and empire. Indentured Servitude… this is a contract offered to immigrants today as they are thrust into foreign nations who then vote in the manner as dictated by their contracts, administered by those already established within foreign nations who ensure the new comers join their community to become slaves to the corporate platform secured in benefits and housing belonging to the taxpayer, the kick back shows itself in the insistence that the immigrants must vote and comply with the corporate state in order the corporate state continues to exist in direct opposition to the native populations will. The lecture explained how after the destruction of the first temple, while in captivity, the Israelites, though they use the term Jews, formed the synagogues. Within the synagogues they compiled what is the backdrop to the Zionist creed as the first 12 chapters of Genesis, the compilations called Isaiah, Jeremiah, Ezekiel and Daniel which they decreed the most renown and the blueprint for the coming Jewish global empire. From that we gain insight into who Jesus was speaking of when he spoke of the Synagogue of Satan, it would be that which was born in Babylon and not of the Hebrew heritage. Therefore we can better understand that there is a demarcation between the writings of the Hebrews (the Torah) and the newly Babylonian formed doctrine under the command of the newly formed synagogues and rabbinical law, (the Talmud), this is best described as the formation of the laws of man under the Babylonian King Cyrus, as described by Pharaoh. That without the temple they still had the covenant. They needed to realise that however much they might “sit down and weep by the waters of Babylon as they remembered Sion” (a phrase that is still used in Lancashire and Yorkshire Installation ceremonies) there was limit to the exile. That they were in the mean time to preserve their brand new and distinctive tradition whilst also benefitting from the opportunities made possible for their special talents and abilities in this land of exile. The traditions of which they speak are the sacrificial rites at the temple, which they no longer had as the punishment, therefore the covenant was no more. The lecture cites those talents accorded to the Hebrews as teachers, lawyers, financiers and administrators. Mmmm. The first point is an outright inversion, the whole symbolism in the destruction of the temple was as punishment for disobeying their God, the covenant was broken and therefore dead. The second is worrying in that we can no longer presume Freemasonry as Christian at the 7th degree and above. 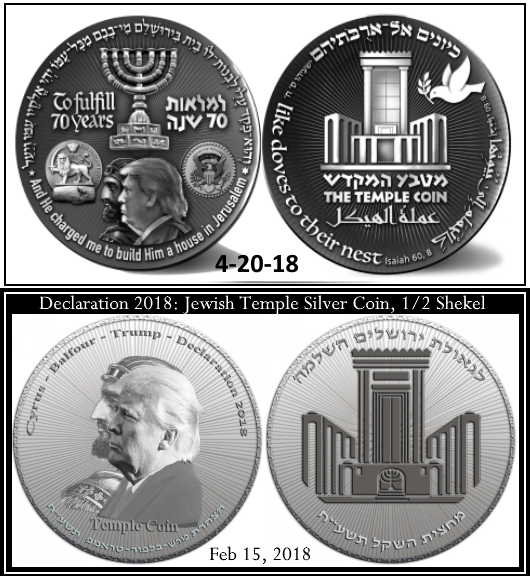 If we turn to the fake and extra Biblical idea of a third temple, the one Trump is facilitating as I write, then a study of the evil works of Ezekiel give you the doctrine under which the third temple is to act against all non Jews. In the case of Freemasons, who are classed as gentiles under the Noahide, the same for the Mormons, the Jehovah Witnesses, the Zionist Evangelical’s and the secret society combine as a whole, they are the slaves chosen by the elect to administer the will of the ‘fake’ third temple. Historically, therefore, the Egyptian captivity, the slaying of “all the firstborn of Egypt”, the exodus toward and conquest of the promised land are myths. The story was invented, but the lesson, of vengeance on the heathen, was implanted in men’s minds and the deep effect continues into our time. It was evidently invented to turn the Judahites away from the earlier tradition of the God who, from the burning bush, laid down a simple law of moral behaviour and neighbourliness; by the insertion of imaginary, allegorical incident, presented as historical truth, this tradition was converted into its opposite and the “Law” of exclusion, hatred and vengeance established. With this as their religion and inheritance, attested by the historical narrative appended to it, a little band of human beings were sent on their way into the future. By the time of that achievement of 458 BC, many centuries after any possible period when Moses may have lived, much had happened in Canaan. The nomadic Habiru, supplanting the native Canaanites by penetration, intermarriage, settlement or conquest, had thrown off a tribe called the Ben Yisrael, or Children of Israel, which had split into a number of tribes, very loosely confederated and often at war with each other. The main body of these tribes, the Israelites, held the north of Canaan. In the south, isolated and surrounded by native Canaanitish peoples, a tribe called Judah took shape. This was the tribe from which the racial creed and such words as “Judaism”, “Jewish” and “Jew” in the course of centuries emerged. Scriptures include it among the tribes of Israel, and as the others mingled themselves with mankind this would leave it the last claimant to the rewards promised by Jehovah to “the chosen people”. However, even this claim seems to be false, for the Jewish Encyclopaedia impartially says that Judah was “in all likelihood a non- Israelitish tribe”. This tribe with the curious air was the one which set out into the future saddled with the doctrine drawn up by the Levites, namely, that it was Jehovah’s “chosen people” and, when it had done “all my statutes and judgments”, would inherit a promised land and dominion over all peoples. Among these “statutes and judgments” as the Levites finally edited them appeared, repeatedly, the commands, “utterly destroy”, “pull down”, “root out”. Judah was destined to produce a nation dedicated to destruction. Ladies and gentlemen, we have a serious problem with the secret societies as a whole. They are actively deceiving their own brethren which in turn allows for the entire nation to be subject to the deception. Here is the only issue that needs to be addressed if we are to move our domestic system back into the realm we have taken for granted for centuries. Politics today is controlled and commanded from within the secret societies, ergo, to change the politics we need to uproot this sinister and dark agenda being carried out through the societies that eat away at sovereignty, both of nations and as individual sentient beings through the command of commerce and finance.